European observers have said violence marred the run-up to polls in Turkey in which the Justice and Development Party (AKP) regained its majority. The OSCE said that an increase in violence, particularly in the south-east, "restricted some contestants' ability to campaign freely". It also criticised curbs on media freedom. 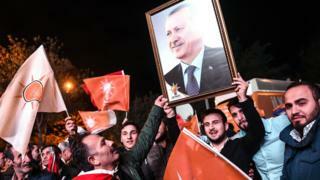 Earlier Turkish President Recep Tayyip Erdogan called on the world to respect the result of Sunday's election. Meanwhile, the Parliamentary Assembly of the Council of Europe (PACE) went further and denounced the entire process as "unfair". In a statement on Monday, Ignacio Sanchez Amor, head of the OSCE observer mission, said: "Physical attacks on party members, as well as the significant security concerns, particularly in the south-east" had affected campaigning. He added that pressure on journalists - including a police raid on the Koza-Ipek media group in Istanbul last week - was a major concern. "Unfortunately, the campaign for these elections was characterized by unfairness and, to a serious degree, fear," said Andreas Gross, Head of the PACE delegation. Responding to reports of pressure on journalists, the White House spokesman John Earnest said the US had urged Turkey "to uphold universal democratic values." With almost all ballots counted, state-run Anadolu news agency said the AKP had won 49.4% of the vote, with the main opposition CHP on 25.4%. President Erdogan hailed the result early on Monday, saying: "The national will manifested itself on 1 November in favour of stability." But he also attacked media criticism of him and called for global recognition of the election result. Prime Minister Ahmet Davutoglu will now begin the process of forming a new government. Mr Erdogan called the second general election this year after the AKP lost its parliamentary majority for the first time in 13 years in June, and attempts to form a coalition failed. The pro-Kurdish HDP crossed the 10% threshold needed to claim seats in parliament, but it got 21 fewer seats than in June's election. The nationalist MHP's share of the vote also declined, to 11.9%, and commentators suggested it had lost voters to the AKP. Clashes were reported in the mainly Kurdish city of Diyarbakir, in the south-east of Turkey, as the results were being counted. Reuters said police had fired tear gas at protesters throwing stones. Since elections in June, a ceasefire between the Turkish army and militants from the Kurdistan Workers Party (PKK) has collapsed. Critics have accused Mr Erdogan of renewing violence to curb support for the HDP - something the government denies. HDP co-chair Selahattin Demirtas said on Sunday that it had not been "a fair or equal election". The party suspended campaigning after a bombing in Ankara last month killed more than 100 people. The government said the attackers were linked to the Islamic State (IS) group. Violence has escalated in Turkey since a suicide bombing in July by suspected IS militants. The attack near the border with Syria killed more than 30 Kurds. Turkish newspaper front pages reflect the contrasting euphoria and gloom from government supporters and opponents at the election result. "Ballot box revolution" declares Sabah, echoed by Aksam's "November revolution". Pro-Islamist papers are equally jubilant, with Yeni Safak hailing a "magnificent victory", and Yeni Akit offering "congratulations to the Muslim world". 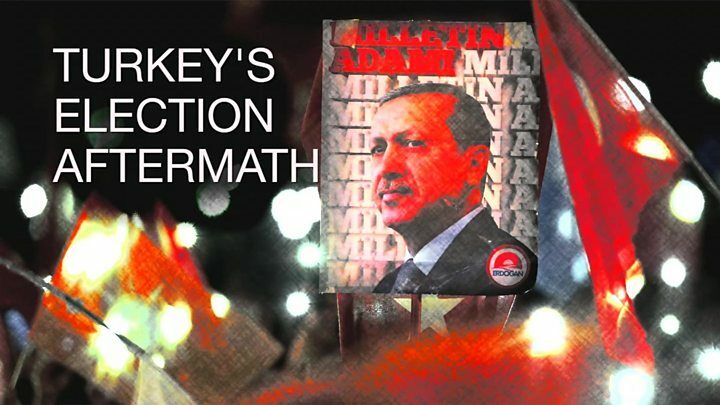 The independent mass-circulation Hurriyet and Milliyet focus on the scale of the ruling AKP's win. Opposition papers accuse the authorities of scaring voters with the prospect of civil strife. Cumhuriyet sees the "victory of fear", while the Sozcu tabloid thinks "terror has increased". The left-wing daily Taraf accuses President Erdogan of using a "chaos plan" to whip up public insecurity, and the pro-Kurdish Ozgur Gundem predicts a "new era of struggle".